Did you know I run a workshop on how to paint furniture with chalk paint? It's called the Power of Paint and I run it from my home with very small numbers so I can give plenty of one-on-one tuition. The workshop runs from 10am to 3pm and includes a picnic style lunch of salads, cheeses and charcuterie. 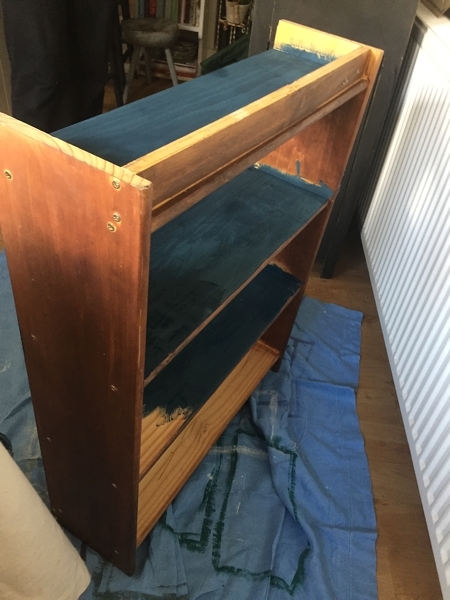 You learn the preparation, painting, distressing and waxing of a piece of furniture as well as how best to style it in your home. It's a lot of fun and you leave with a piece of your own furniture painted and ready to use as well as the confidence to paint more furniture! The most recent workshop was Saturday 21 July with two very eager students. One student brought her Ikea bedside table and chose to paint it in Annie Sloan Greek Blue with the knob in Annie Sloan English Yellow. With a modern piece like this there is nothing to distress on the edges so it's just a straightforward paint job and then clear wax to protect it. The other student brought an old freestanding bookcase that she wanted to use in her bedroom. She chose one of my favourite Annie Sloan colours, Aubusson Blue. With dark wood furniture it can look nice to distress the edges and use Annie Sloan's clear wax and then her dark wax to add extra character. However this student preferred to keep it simple and just paint it and add a layer of clear wax. Once her daughter saw it transformed she claimed it for her own room! Penny "I did the Power of Paint workshop and thoroughly enjoyed it as learnt a great deal. Angela gave me loads of tips and guidance and I was able to transform a tired old chair into something very beautiful and useful. Angela has a great eye for colour and style and was so easy to talk to and develop ideas with. I will certainly be booking another course with Angela soon as she has given me the confidence to upcycle and be brave with colour choice." Frances "Angela’s workshop was fantastic, I managed to transform my bedside table in the session. It was also my first time using chalk paint which I had previously been nervous about. Angela’s shared her expert skills so I can go forth and paint more." Did you know I run a workshop on how to paint furniture with chalk paint? It's called the Power of Paint and I run it from my home with very small numbers so I can give plenty of one-on-one tuition. The workshop runs from 10am to 3pm and includes a picnic style lunch of salads, cheeses and charcuterie. It's a lot of fun and you leave with a piece of your own furniture painted and ready to use! An epidemic of grey interiors!